Our product range includes a wide range of teknik horizontal autoclave, teknik vertical autoclaves and teknik vertical laboratory autoclave. 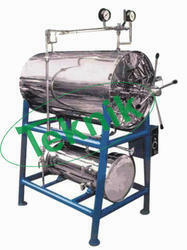 has construction same as autoclave vertical but in horizontal position and without steam jacket. 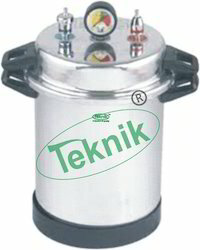 Vertical Autoclaves : A versatile electrically heated sterilizer under saturated steam of adjustable pressure. The lid is made of stainless steel or gun-metal plate, tightening all round with wing nuts. Automatic low water level cut-off device. Note : Models are provided with pedal lifting device. Looking for Laboratory Autoclave ?